For many wedding couples, finding their ceremony site requires no thinking. One or both of them grew up going to the same church, they always belonged to that church, they know the wedding officiants of that church, their family expects them to get married in that church, they will marry in that church. They need to make contact with their officiant and church far enough in advance so they get dibs on that church, for churches book weddings on a first reserve basis. If a couple is not affiliated with a particular church and they want to be married in a particular church, they are best to join a church enough in advance in order for them to be married in that church. It is recommended to attend a few church services before joining a church to be sure that church is right for the couple. There are dozens of religious affiliations to become members of. Check out the churches creed to see if it's near your religious thinking. The major religious affiliations are assembly of God, baptist, catholic, christian, Greek orthodox, lutheran, methodist, presbyterian, and for the Jewish faith synagogues and temples and for Arabs there are mosques. Churches all have their own personality of church teachings, doctrines, and ceremony. Some have a strict formal ceremony such as Catholic and others are relatively informal structure such as Protestant. Most churches have music as part of the service and come very varied. Some churches have an organ and the parishioners often sing psalms or hymns. Other music played at churches are guitarists, choruses, contemporary music, full church bands, rock bands, brass band, string quartets, pianists, harpists, violinists, and vocalists. Many churches offer church programs on top of the church service. The services often can be found on a church website. The church may offer bible studies, have general religious discussions, provide counseling, create programs & productions such as musicals & plays, and offer after school programs, camps, arts & crafts and religious classes for young people. 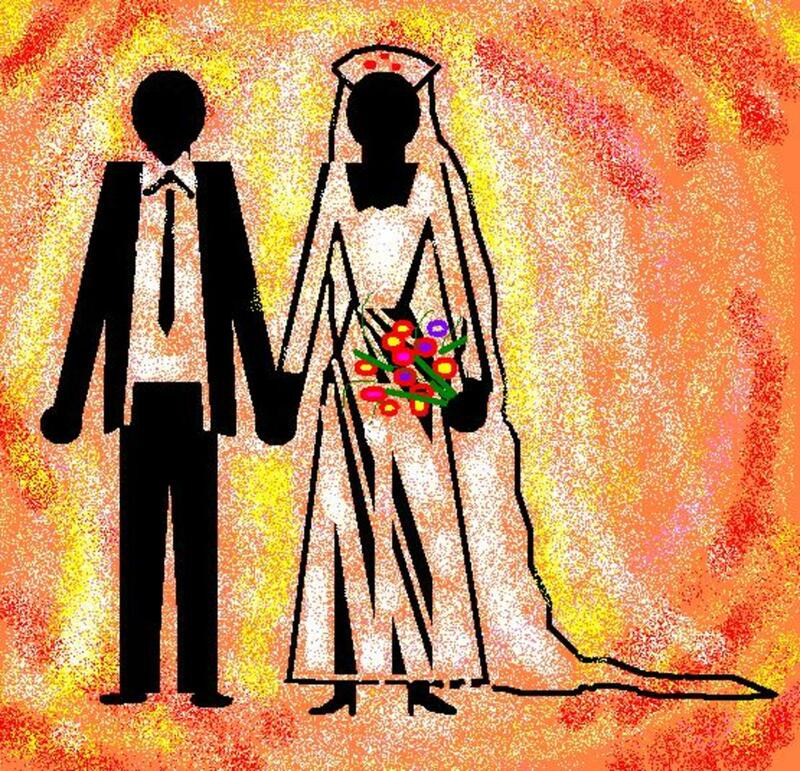 Besides finding a church, you will need to find an officiant that will marry you, sometimes they will require pre-marriage counseling. Many churches have a church secretary or wedding coordinator, that you need to contact to seek help on what one must do in order to get married in that church. Sometimes this person is a volunteer and sometimes they may charge a fee. This contact person is a great source for most of your wedding ceremony needs. They can help you plan your ceremony, tell you who you need to contact, provide you with some decorative needs for your ceremony, and find you wedding musicians for your wedding service. In your discussions with the church wedding coordinator, you should see if the church has a holding room for the bride and bridesmaids. Also is there a room or space for groomsmen, wedding performers, ushers, and a place for the wedding photographer's equipment that is a protective space. Check with the coordinator on church decorations including altar decorations, candelabras, pew bows, aisle runners and other decorations for doors, banisters, and walls. In your discussions, you will also need to discuss cleaning arrangement after the wedding ceremony. What is allowed and not allowed, are flower petals, rice, bird seed, bubbles, and wedding sparklers allowed? Someone may need to return psalm books and bibles back behind the pews. Someone may need to pick up left behinds programs, newsletters, and other papers up off the pews and floor. Someone may need to sweep and vacuum after the service. Someone may need to move decorations to the reception hall, or leave behind decorations for the next wedding service. If the budget is a little tight for your wedding you might consider getting married in a wedding chapel. Almost every city has a few quaint, charming, and romantic wedding chapels usually off the beaten path. Many chapels are situated in lush surroundings, they may overlook a lake, hidden in the woods, found on a winery, or near a mountain top. They may be worthwhile to check out. Set up an appointment with the chapel's and get a review of how their service is run and find what services they offer. Many wedding chapels offer different packages, often showing a checklist of services, do you want piped in music, a photographer, how do you want decorations to show, what marriage reading do you want, etc. Make sure you bring your marriage certificate. Many wedding chapels are great but be careful of a few that aren't so great. Some chapels have a quick ceremony, ten minutes the service is over, you feel like you missed your own wedding, the parking lot must be empty for the next wedding, no lingering allowed. You feel like a number, the romantic wedding feeling just does not happen. For a chapel wedding, work closely with the chapel coordinator, get a close gut feeling if the coordinator is geared to the couple or geared to a rushed wedding. Ask for contacts of other couples that got married in the chapel over the past year and ask them about their wedding experience. Ceremony sites other than churches have increased tenfold in the amount of weddings that have had over the last two decades. There are beautiful venues that can host weddings popping up all over the place. You can also create a beautiful wedding space at many venues with a little imagination, decoration, and enough space. One place that has gotten very good at hosting weddings are many of your four and five star hotels. Matter of fact, many hotels have redesigned their business and designed their hotel geared to weddings. 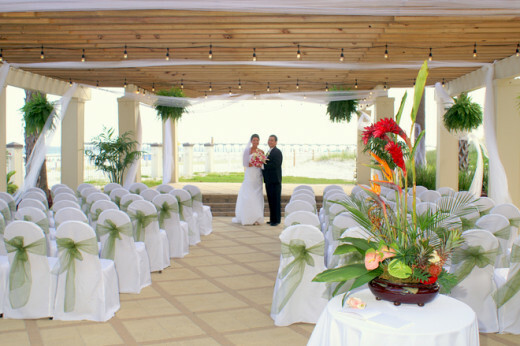 Many have incorporated a number of wedding ceremony locations on their hotel grounds. 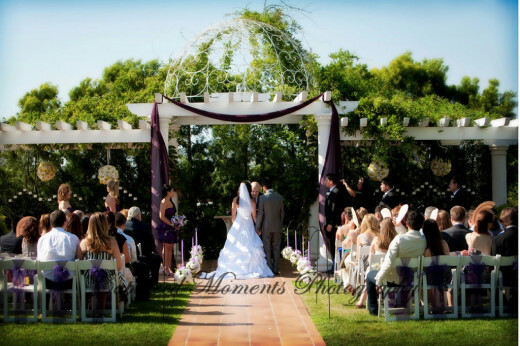 Some have created a beautiful gazebo or pretty garden outside and a pretty lobby inside for a wedding ceremony. If the weather is beautiful the wedding is held outside, and should the weather become inclement the wedding moves inside. The thing that is nice about weddings in hotels, many hotels have hired an expert wedding coordinator who is knowledgeable about weddings and the staff they hire often is very personable. The other thing that's great about having a wedding in a hotel is the bundling of services. Many couples think they can't afford a wedding in a hotel, think again! By bundling wedding services, the wedding costs are not much different than a conventional wedding. Here is what you get for a hotel wedding! You get a ceremony site, a reception site, catering, bartenders, chairs, tables, linens, dishes, flatware, beverage glasses, cups and saucers, coffee, decorations, centerpiece decorations, flowers, alcohol, wedding cake, hors d;oeuvres, desserts and sometimes ice sculptures. Many of these hotels also provide professional wedding photographers, sometimes videographers, have contacts with many wedding musicians, and disc jockeys, and have a dance floor for guests to dance on. Some hotels can connect you with a wedding officiant and some of their wedding coordinators can even help in the wedding invitation process and even wrap wedding favors for the bride. Not much limousine service is needed to. The chefs at many of this hotels are very world class have had to have training in good culinary schools, the food, hors d'oeuvres, desserts and wedding cake is exceptional and their presentation is very pretty. The bartenders at these places are very knowledgeable and have mastered the art of making cocktails the way they are suppose to be made. By bundling all these services together, the cost of the wedding ends up being in the ballpark of most conventional weddings. Hotels often have connections and many of their vendors are on a preferred list. The preferred vendors have proven themselves. If you want to bring your own vendor, you will have to ask the hotel, how can you get the vendor onto their approved list. One other thing about having your wedding at a hotel, you can book a block of rooms for your wedding guests. This is great especially for out-of-town guests. If you reserve enough rooms and they get booked, it may be 6, 10, or 15. Book enough rooms and the wedding couple gets a bridal suite many times for free or for a significant discount. 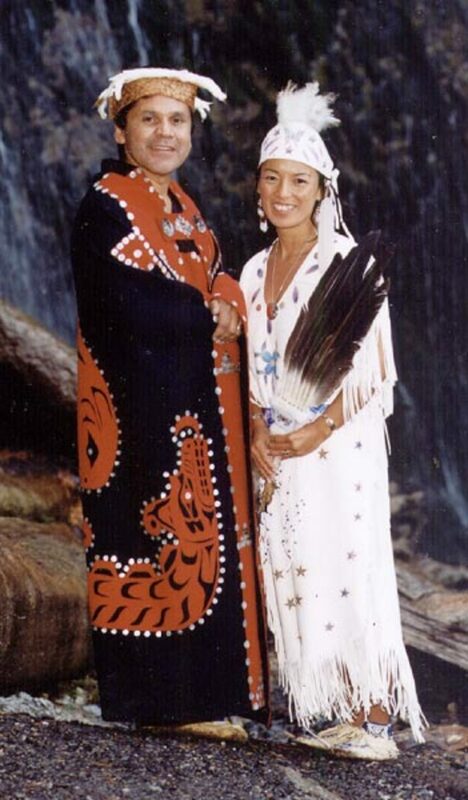 There are many ceremony sites to consider, many you may have never thought of. You can have your wedding at an art museum, a science museum, zoo, aquarium, in a beautiful municipal building, a unique business location or their banquet room, a room in an office tower, a lobby of a big building, a learning center, beautiful campus buildings, a roof top over looking a city, a golf club, a country club, a yacht club, a market square, a historical library, a city club, a wedding bed & breakfast, a ballpark or arena, a rustic building, a director's studio, a banquet hall with a space for a ceremony, a building facility in a park, a train depot, a private airport space, a convention center or an upscale restaurant with a built in gazebo, arch, or garden space. For outdoor weddings, often it is advised to have a wedding tent as a precaution for inclement weather and a place to hold a reception. Spaces to consider for outdoor weddings include, the beach, a lakefront, a riverfront, on a pier, deck or pavilion overlook, a botanical garden, an estate or mansion house, a family members beautiful backyard, a winery, an orchard, a picturesque park, a mountain view top, on a romantic island, a farm or a barn on a farm, on a yacht, or riverboat, on a cruise line or an open field. You have many beautiful choices for weddings all around you and many are located in a unique place. Your wedding guests will duly be impressed and it will be an enjoyable experience for them and a special event they will always remember. Some venues cost a little more and some won't cost much at all. Be sure to check any ceremony sites for any hazard conditions. Make sure none of your guests will be at a space that don't have holes, don't have loose branches, don't have bugs and wild critters, and don't have open waterholes for little ones to fall in. Also check the venue for restrictions, is there restrictions on parking, noise, time for event shut down and restrictions on event decorations. Before your meeting with a ceremony site you should take your total budget and break it down by wedding category. You should find a wedding calculator or budget allocator to break down all your wedding expenses by wedding category. 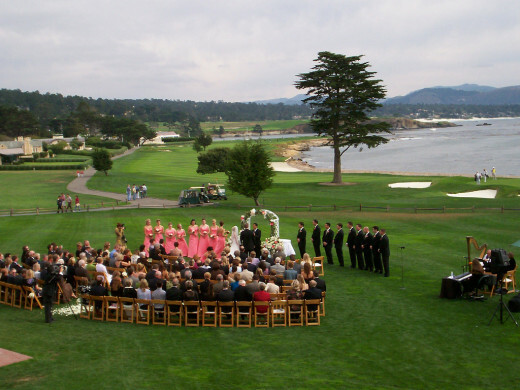 You should have derived a budget for your ceremony site, reception site, catering and rental services. You want to go to your meeting with the targeted date of your wedding, your budget for your ceremony site, and your food budget, catering budget and for supplies. You should have an idea on how many guests for your wedding ceremony and possibly for wedding reception too! The first thing before calling on the phone is check the ceremony's website out if they have a website and gather intelligence about the ceremony site. Look at the text, the pictures, the videos, and jot down the name of the business, important phone numbers and address and put into a diary in which you are taking notes. Maybe check with google Maps or mapquest how far the ceremony site is from the bride's home. Your first interview with a ceremony site should be over the phone. You should target having interviews with 3 or 4 ceremony sites. Your first question on the phone should be to find the best person to talk to about the ceremony site, get that person's name, phone number, email address or other contact information and the best time to call and tell whomever you are talking you will make contact at the time you called or maybe be called at a specified time. When you identify the contact person for the venue, first find if the wedding venue is available the date of your targeted wedding date. Second, tell them the amount of wedding guests you are hoping to invite, is the venue the right size for the amount of wedding guests you are planning for your wedding. You want the size about right, you don't want a venue space that is too crowded or your guests won't have much elbow space, the venue will be too noisy. You don't want a space that looks empty, the event will look like something is missing, the atmosphere won't be exciting, and you will be overpaying for the space. The third thing you want from the phone interview is the cost. You want to come up with a range of costs, is the venue only a ceremony site or does it have both a ceremony and reception space. If it's only for the ceremony give use your ceremony budget as your high number and low range 10 to 20 percent below your high number. If the venue include both ceremony and reception, give the venue a high number adding your ceremony budget, reception budget, your catering budget, and rental services budget. Add those four numbers together that should be your high range and low range should be 10 to 20 percent below the number given. Determine If the venue costs is within your range. The fourth question is how was the demeanor of the people you were talking to over the phone? Were the people you talked to over the phone have good phone matters and act professionally? If the people were nice on the phone, their staff tends to be nice in person too! Set up an in person interview if the wedding date is available, the space is the right size of your wedding guests, if they give you a budget, not more than 25% than your high range, and the demeanor was good on who you were speaking to. If the wedding date is not available, are you willing to change the date! You might be able to negotiate down the rate as long as it's not too high. Don't waste each others time if the budget is out of range, besides you might fall in love with the place and will only get disappointed. Before the appointment, prepare a list of questions to ask. When you meet with the ceremony site in person, be sure to be on schedule, you want a good first impression which may enable you to get good deals. Call the venue should you get caught in traffic. It's a good idea to bring a companion along, maybe a wedding planner, your mother, your sister, your brother, your maid-of-honor or best friend, possibly your fiancee, depends on the situation whether if he is involved in planning the wedding. The companion is both a witness and helps the conversation get more serious and allows more of a discussion. You first should ask for a business card and see if they have a brochure to share. Let the wedding coordinator speak first and educate you and give you an overview of the place, Next you should give a high level of what you envision for your wedding. Then refer to your question sheet, a brochure or they might have answers to many of your questions, but any questions you have that aren't answered ask them. Then let them talk a little about the things that came up and then ask for a walkthough of what would be your wedding space. Try to see everything that would be your wedding space, take notes, pictures, and video if you can of the space and meet for last minute thoughts. Always be polite, thank them for the interview. Sometimes before you leave a meeting with a ceremony site or reception venue, you may see some sales pressure. You don't want to commit, you want to hold them off until you get your 3 or 4 interviews in with ceremony sites. They may say, the deal is good for today only, that's a sales tactic. You should interview all your ceremony sites within 10 days of each other and whomever you decide to book with, book them no later than two weeks after your appointment. Once you have decided, let the other ceremony sites you interviewed with have booked with another venue. Never say anything bad to all the ceremony sites. Don't burn your bridges, they may be possibly a backup in the event your deal does not go through. Be courteous and let them fill know not to keep your slot open and so they can book another wedding couple with no harm to their business. Decisions, decisions, you interviewed a number of ceremony sites and can't decide on which one to choose. Or you may really have fallen in love with a place and have no reason to go through a scoring exercise. But if you need a little help, this is a good exercise to help you choose a place. 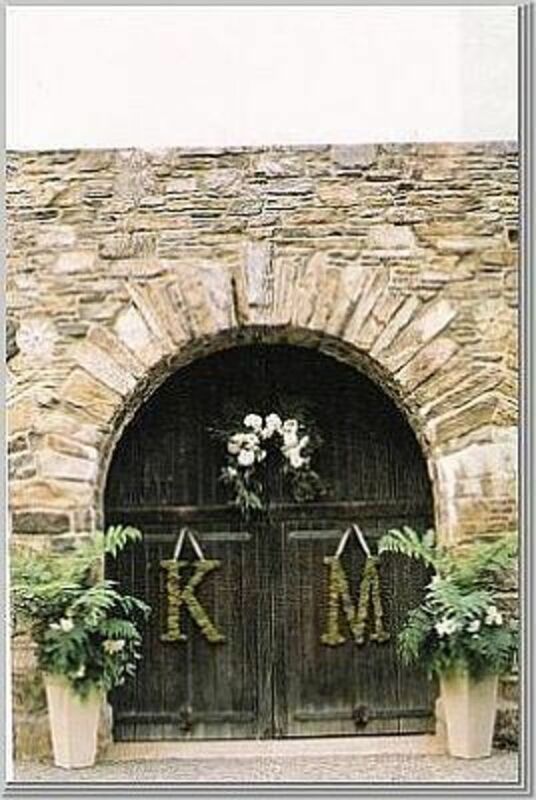 Location - Determine how far your ceremony site is from the bride's house or bride's origination place. Score 10 if less than 4 miles, score 9 if from 4-6 miles, score 8 if from 6-8 miles, score 7 if from 8-10 miles, score 6 if from 10-12 miles, score 5 if from 12-14 miles, score 4 if from 14-16 miles, score 3 if from 16-18 miles, score 2 if from 18-20 miles, and score 1 if greater than 20 miles. If you are scoring a reception location go through the same exercise of distance between the ceremony site and reception site. Wedding Coordinator - Score 1 point for each attribute the wedding coordinator has. score 1 point if they have been a coordinator for more than 5 years. score 1 point if they have received training to perform their job. score 1 point if they appear to have good communication skills. score 1 point if the wedding couple or bride feels at ease talking to them. score 1 point if they seem good at organizing. score 1 point if they seem to know the facility very well. score 1 point if they seem to be respected by all employees. score 1 point if they are always in an upbeat mood with a smile. score 1 point if they are good at keeping the wedding couple informed and up to date and answer questions, and score 1 point if they seem to have everything in control. Communication Skills - Does the venue effectively communicate with the wedding couple. Do they make contact when things come up, are easy to reach and gets back to the wedding couple when a moment frees up, are they good at communicating with others and do they touch base on what's happening regularly. Experience of Staff - Is the average age of service is 10 or more years Score 10 points, 9 years score 9 points, 8 years score 8 points, 7 years score 7 points, 6 years score 6 points, 5 years score 5 points, 4 years score 4 points, 3 years score 3 points, 2 years score 2 points, and 1 year of less score 1 point. Charm Factor - How beautiful is the surrounding are score 2 points, how beautiful of the building or area from a distance score 2 points, how beautiful is the entrance way score 2 points, how beautiful when you walk through the entrance score 2 points, and how beautiful does the place look from a seat score 2 points. Architecture - The architecture is basically the layout arrangement of the venue. Does the venue have a nice flow. If the venue is a reception area does it have a good area for dining, drinking, talking, and dancing. For a ceremony site does it have good perimeter space and plenty of space for officiants, readers, musicians and for the bridal party. Does the venue have beautiful decorations nice molding, plenty of art or sculptures and stained glass windows. Does the venue have good lighting and sound acoustics score 10 points for all of the above, score 1 point for none of the above, or a number in between. Theme and Style - Does the venue allow the bride to have the theme and is it the type of location she wants or is really not the theme or location she was looking for. score 10 points if she likes the wedding theme whether it be contemporary, country or Victorian and she is happy with the theme and does she like the location whether it be in a beautiful building or would she rather it be an outdoor nature wedding. score 10 points if she really likes the theme and style and score 1 point if she does not like the theme and style or some number in between. Logistics - Does the ceremony site have 1 point each. score 1 point for a holding room for the bride. score 1 point for space for musicians, readers, and photographer. score 1 point for plenty of perimeter room at the venue. score 1 point for spacious ceiling and outdoor location. score 1 point for a privacy area. score 1 point for not competing with other vendors. score 1 point has ample outlets. score 1 point for good acoustics/vibrations. score 1 point for good lighting and score 1 point for good parking. For a wedding reception score 1 point for plenty of room for dining, score 1 point for plenty of room for drinking. score 1 point for plenty of room for talking. score 1 point for plenty of room for dancing. score 1 point for a privacy area. score 1 point for not competing with other vendors. score 1 point has ample outlets. score 1 point for good acoustics/vibrations. score 1 point for good lighting and score 1 point for good parking. How Long in Business - Score 1 Point for each year in business. 10 or more years in business score 10 points, 9 years in business score 9 points, down to 1 or less years in business score 1 point. Decoration Possibilities - Does the wedding couple have complete control in decorating give 10 points, no control score 1 point, or score a number in between. Amenities and Extras - Does the venue offer a lot pf extra amenities with their business? Do they provide decorations, provide extra staff, provide chairs,provide lighting, provide an engineer for lighting and sound needs. If a reception facility, do they provide bartenders, wait staff, linens, dishes, elegant centerpieces, tables, chairs, sofas, wedding cake, musicians, photographers, dance floor, etc. If they offer a lot of amenities score 10 if none score 1 or somewhere in between. Website - Website often correlates on how well a business is doing. A good website gives a good first impression when it pops up on the screen and pretty fast. The website is loaded with good text, pictures, and videos and provides good contact information. Score 10 points for a really good website and 1 point for not a good website or no website. Add the scores up. Whichever venue has the highest score, statistically is the one to go with. This is only tool to help in deciding who to go with, but final decision is your to make.